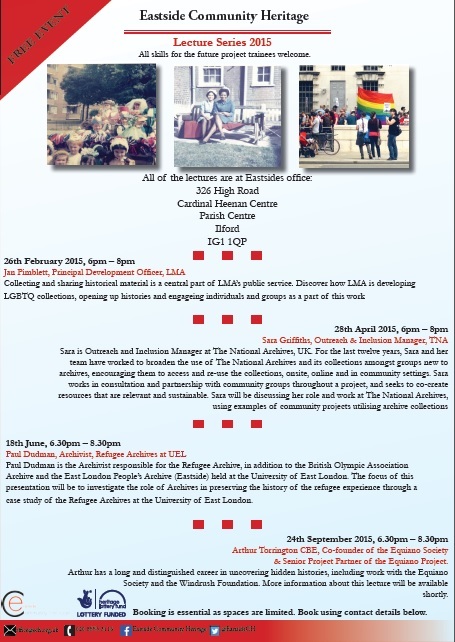 We are always looking to organise new events to help raise awareness and encourage the accessibility of our Archival collections here at the University of East London. We are interested in running a regular programme of events to include talks, workshops, exhibitions and events, and please do Contact Us if you would like arrange an event for your group. case study of the Refugee Archives at the University of East London. The lecture series will begin on Thursday 26 February with a talk given by Jan Pimblett from the London Metropolitan Archives and wil continue with talks from Sara Griffiths, The National Archives, on Thursday 28 April, and Arthur Torrington CBE on the 24 September. The events are free but booking is recommended. Please download the Eastside flyer for futher information: Eastside Community Heritage Lecture Series 2015 flyer (PDF File). As part of our Archival holdings here at UEL, we do currently hold Eastside’s East London People’s Archive oral history collection. This oral history collection preserves the oral history recordings of the various projects “conducted by Eastside Community Heritage document the lives of ‘ordinary’ people in East London. Topics include World War Two, women’s history, markets, boxing, ethnic groups in East London, food and parks.” (Reference: Eastside Community Heritage). Please contact the UEL Archives on library-archives@uel.ac.uk for further information on how to access these materials.